I’m having a moment with cooked greens. I know, this is thrilling news, right? I’ve put cooked kale in my mashed potatoes, and now I’m sautéing collard greens for every dinner. These collards are a little garlicky, a little lemony, and seriously irresistible. They’re the perfect quick and healthy side dish, and they’re exactly what I’m craving as we get a taste of spring weather. I cooked these collards greens in the Brazilian style—quickly in hot oil, with some garlic and chili flakes. In Brazil, these collards frequently accompany the national dish, called “feijoada,” which is a rich black bean stew cooked with pork, and rice on the side. If you’re vegetarian or vegan, take note that these collard greens would go great with black beans and rice. Now that our brief history lesson is complete, want to learn how to make this delicious side dish? Cut the thick central ribs out of the collard greens, and stack the leaves on top of one another. Starting at one end, roll them up into a cigar-liked shape, then slice across the roll to make skinny rolls of collard strips. Use a sharp chef’s knife for this, and make your slices as thin as possible—ideally about 1/8-inch wide. Give the collards a few extra chops to break them apart. Warm a large, heavy-bottom skillet (cast iron is great) over medium-high heat. Add a generous drizzle of olive oil (the oil will later help your body absorb the nutrients in the greens). Then add the greens and some salt. Give the greens a good stir so they’re all lightly shimmering from the oil and turning darker green. Let the greens cook against the pan in 30-second intervals, stirring in between. Thanks to the hot oil in the hot pan, some of the collards will eventually develop crisp, browned edges—these taste so good! Once you see a little browning action, add the garlic and red pepper flakes. I suggest adding the garlic at this point, rather than before, because otherwise it’ll burn by the time your collards are done. Transfer the collards to plates so they stop cooking. Serve with a wedge of lemon, and you’re done. Thanks to the lemon and garlic, these greens taste Mediterranean. Serve them with pasta, lasagna, or other Italian/Greek entrées. Here’s a simple spaghetti dish with these collards. As I mentioned, these collard greens go great with cooked black beans and rice. 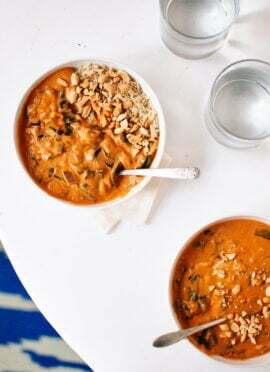 Take inspiration from West African cuisine and add chopped peanuts. Kale is a great substitute for the collard greens, if you can’t find collards or have an extra bunch of kale. 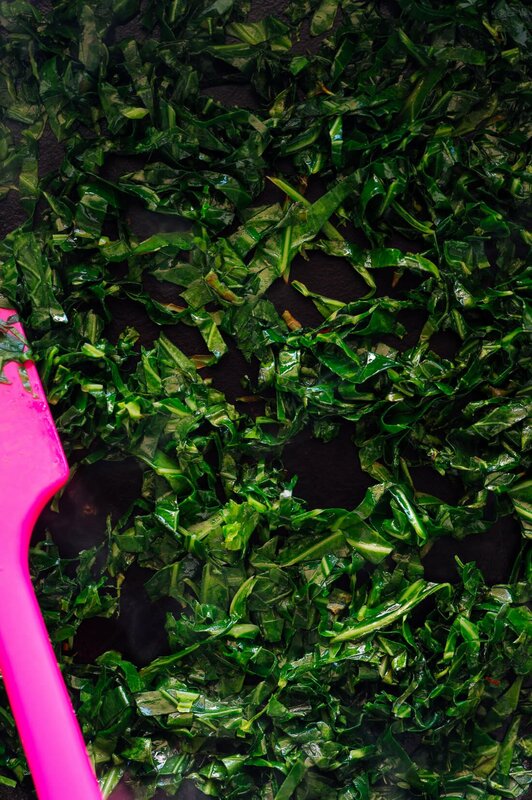 These quick-cooked collard greens are also surprisingly fantastic with Asian flavors. If you’ve ever made my kale fried rice, you might appreciate this idea because kale and collards are similar greens. For an Asian spin, you can simply reduce the salt (we’re adding salty sauce later) and substitute 1/2 teaspoon grated ginger for the garlic. Once the collards are done cooking, add a drizzle of store-bought teriyaki sauce to the pan, or add 1 teaspoon tamari or other soy sauce and 1/2 teaspoon toasted sesame oil. (Skip the lemon.) So good. Please let me know how these collards turn out for you in the comments! 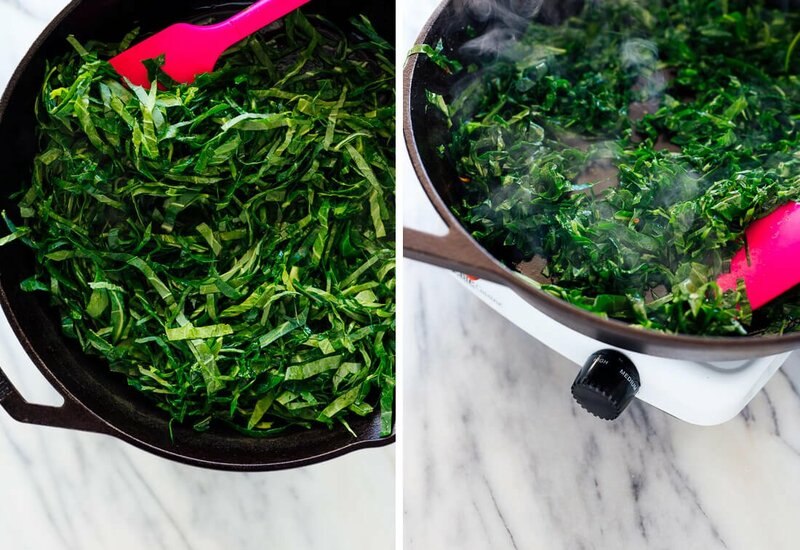 Cooked greens can be surprisingly addictive. 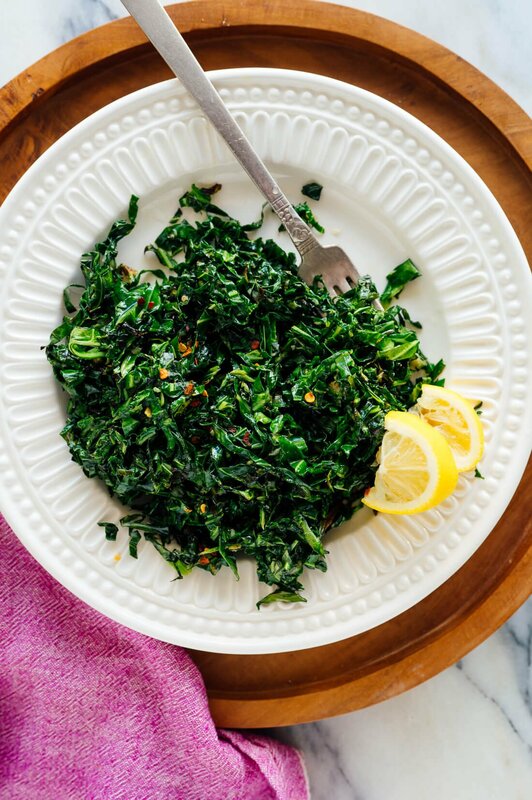 These collard greens are quickly cooked in olive oil and finished with a squeeze of lemon juice. You’re going to love these healthy, vegetarian collards! Recipe yields 2 side servings. To make multiples, simply repeat the ingredients and instructions below (cook each batch separately for best results). 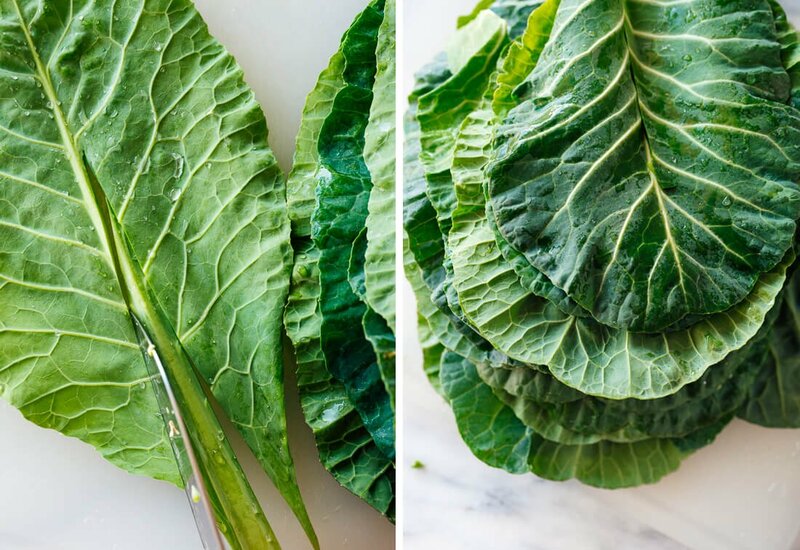 To prepare the collards: Cut out the thick center rib out of each collard green. 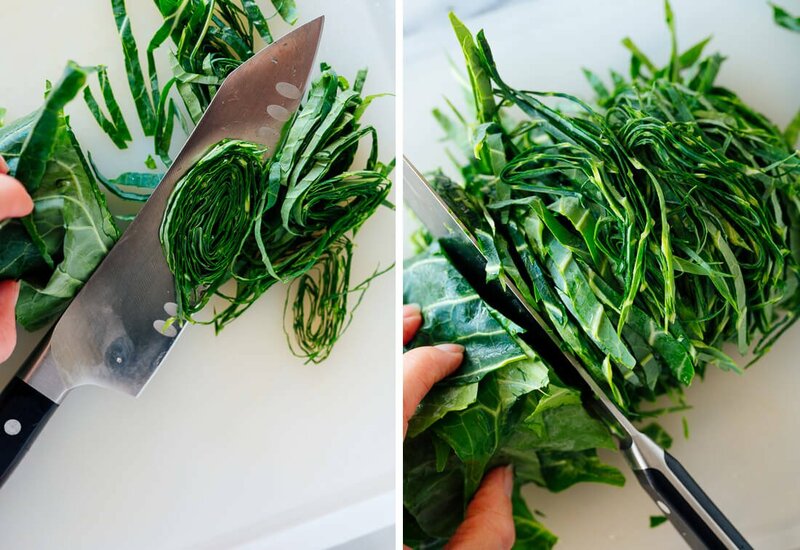 Stack the rib-less greens and roll them up into a cigar-like shape. Slice over the “cigar” as thinly as possible (⅛″ to ¼″) to make long strands. Shake up the greens and give them a few chops so the strands aren’t so long. Heat a large, heavy-bottomed skillet over medium-high heat, then add the olive oil. Once the oil is shimmering, add all of the collard greens and the salt. Stir until all of the greens are lightly coated in oil, then let them cook for about 30 seconds before stirring again. Continue stirring in 30-second intervals until the greens are wilted, dark green, and some are starting to turn browns on the edges (this is delicious). This will take between 3 to 6 minutes. Once the collards are just about done, add the garlic and red pepper flakes (if using). Stir to break up the garlic and cook until it’s fragrant, about 30 seconds. Remove the pan from the heat. 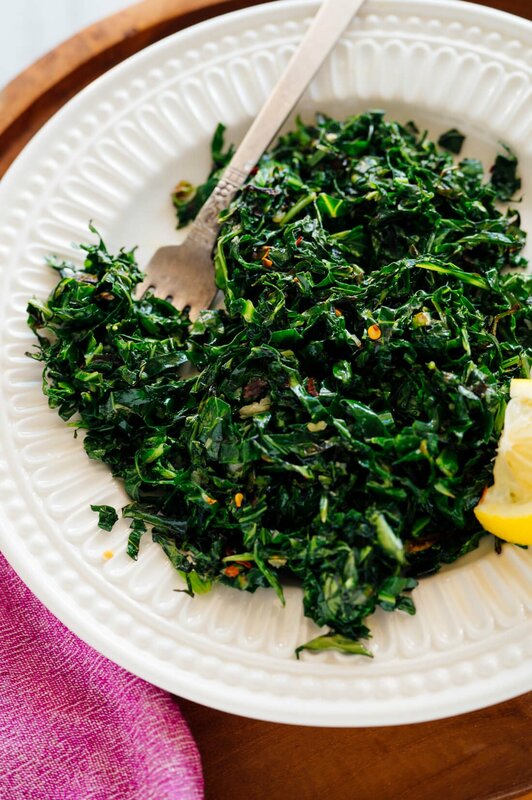 Immediately divide the cooked collards onto plates, and serve with a lemon wedge each. 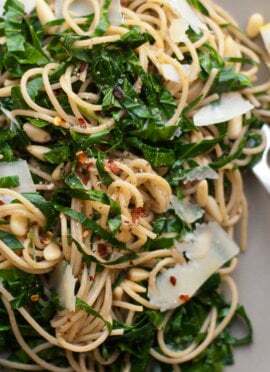 Recipe adapted from my lemony collard greens pasta. This looks delightful! I’m newly converted to frozen green veg: our large grocery store here has frozen collards, turnip greens, kale, and spinach, which can be a great way to reliably and easily have tons of greens, I eat way more than I would otherwise. Thanks for sharing! Hey Kate! I’ve been making my collards like this for years and had no idea they were “a thing”. They are SO delicious – not the soggy, over cooked “southern” variety. I do add a smidge of honey when I make mine and a little bit of Vegeta in place of the salt, since it’s pretty high in sodium. I would urge all your many fans to try cooking their collards this way. 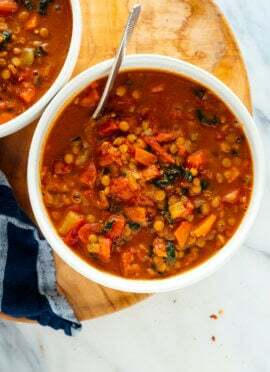 Super easy and by far my all-time favourite veggie!! It’s a thing and I’m all about it! Thank you for your review, Rose. Thank you for your support, Debbi! Thanks, thought I would share that I grew Portuguese kale last year and it is very similar to collards. Super easy to grow and pest free. I have never tried the Asian flavor but I will! Thank you! Is your cookbook / recipes all plant based? Hi Lynda! All of my recipes (in my book/blog) are vegetarian, since I’m a vegetarian. Many are vegan as well. Whenever possible, in both the book and blog, I try to offer vegan substitutions in the recipe notes. Hope this answers your question! First time ever trying collard greens. This was delicious!! I followed the recipe except left off the red pepper flakes. It was good with and without a splash of lemon. Yum! Thank you, Rogenia! Thanks for trying it right away. 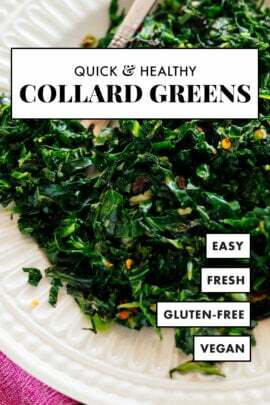 Just made this recipe today because I got collard greens in my weekly produce delivery. They were delicious (and my boyfriend agreed)! Your method of cutting the strips really thin is what takes this recipe to the next level. I’ve made collard greens before just by tearing the leaves into pieces and they were too chewy. I’m glad you liked this version! Give me ALL the garlicky greens! Looks so healthy Collard Greens. Tried these today without the red pepper flakes and drizzled red wine reduction over the top. Will definitely make this again! Great didh and recipe. Interesting content. Hope you share more with us. Holy Hannah! I like collard greens! I’ve tried a few times before but I just couldn’t get onboard. I saw your recipe and it looked so yummy I figured it was worth a shot. And it’s absolutely delicious. Anytime I find a new veggie I can add to the dinner rotation it’s a huge victory. Thank you for sharing the recipe. You’re welcome! I’m glad this one was perfect for you.